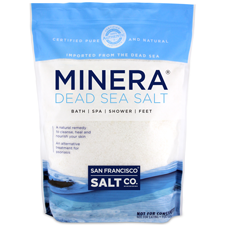 Dead Sea salts are an effective, natural treatment for psoriasis patients. For years, Dead Sea salt has been recognized as wonderful alternative therapy offering long-term relief with no side effects. Not to mention, bathing is a wonderful way to end the day! A series of clinical research studies have been conducted in order to evaluate the effectiveness of Dead Sea salts as treatment for psoriasis. According to several published studies, about 80 percent to 90 percent of psoriasis patients visiting the Dead Sea for treatment are either completely cured or significantly improve. Only less than 1% of patients experience no change at all or a worsening of their condition. The results indeed show that Dead Sea salts are effective at improving the symptoms of psoriasis – take a look for yourself! A 1999 study published in the International Journal of Dermatology tested 100 patients with psoriasis who sought psoriasis relief in the Dead Sea. 75% of these patients were psoriasis free after four weeks of on-site treatment. Of this group, 68% remained psoriasis free 4 months after treatment, while 43% were still clear six months after treatment. In a 2003 study published in the Journal of the American Academy of Dermatology, 27 patients traveled to the Dead Sea for treatment of plaque psoriasis. Their treatment consisted of daily bathing in the Dead Sea and controlled sunlight exposure. As a result of this, 48% of the 27 were cleared of psoriasis completely and stayed in remission. The other 41% demonstrated a positive response to the treatment. In 1989, Israeli dermatologist Dr. Zvi Even Paz conducted a study to evaluate the effects of Dead Sea Salts on 50 psoriasis patients. It had already been established that bathing in the Dead Sea itself brought relief, but it was not known if the Dead Sea salts would have the same effect when used in different environments (such as a bathtub). 47 of the 50 patients experienced significant relief after soaking in a bath containing Dead Sea salts. The best results came to those who soaked in two pounds of salts (divided into 3 baths) three times a week for six weeks. Dr. J. Arndt conducted a controlled study involving 50 psoriasis patients, between 14 and 77 years of age. All patients were treated using Dead Sea salts in partial or full baths and were treated with the salts in a controlled way. In a full bath, 2 kgs of the salts were dissolved in a bath at a temperature of 27 C. The partial baths were made with a concentration of about 10% salt. The baths lasted for 20 minutes and were followed by a rinse. The patient remained in a warm, packed condition after the bath to enhance the effect of the salts. The treatment lasted for 3-4 weeks, with 3-4 baths per week. Within only one week of treatment, symptoms diminished, including itching and scaling joints. Other symptoms such as spread, redness and infiltration continued to decrease. Improvement was steady- after four weeks, patients were clear of all symptoms. The symptom patients were most concerned about was itching, and they were thrilled to be relieved in less than one week. Sleeping disturbances go hand in hand with the itching and are widespread in psoriasis patients – and sleep also improved in Dr. Arndt’s study. Both patients and physicians in the study interpreted the drastic decrease in discomfort and scaling within one week. Healing was complete in 27 patients (54%), and in the other 22 cases, there was vast improvement in their condition. Tolerance to the treatment was excellent in all patients involved in the study, and none of the participants experienced any side effects whatsoever, dermatological or otherwise.